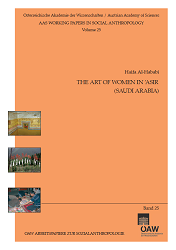 It is unclear when the women of ’Asir began the tradition of painting their interior home walls with vibrant frescoes and murals. According to the fi eldwork research conducted in 1991 and 1992 by Professor Ghithan Ali Jrais, it states that he saw houses that were approximately three to four hundred years old and some of which had diff erent colours and patterns inside.1 This fi nding was also stated in many travel books such as those of Sir Kinahan Cornwallis,2 M. Tamizier3 and ST.J.B. Philby4 and therefore confi rms that the tradition is many generations old. When questioned the ’Asiri women reveal they were taught to paint in their unique way by their mothers and their grandmothers before them. The architecture of the ’Asir region is rich, but the interiors of these beautiful houses are in danger of becoming extinct before the world learns much about them.